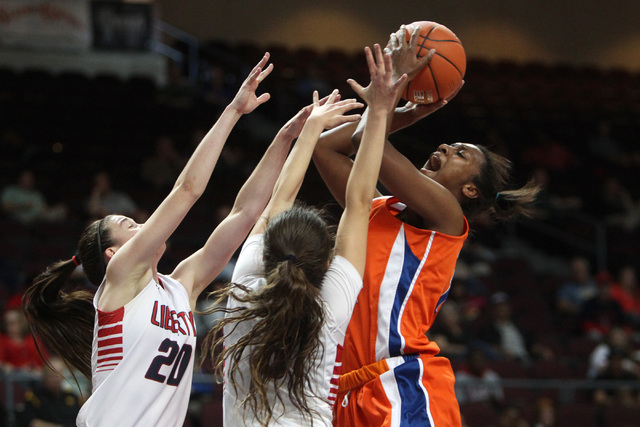 Bishop Gorman senior forward Madison Washington made an oral commitment to Oregon State for women’s basketball, announcing her decision late Tuesday on Twitter. Washington’s commitment is nonbinding, and the first day she can sign a letter of intent is Nov. 11. Oregon State’s coaches cannot comment until that time. “I am truly blessed to say that I have committed to Oregon State to continue my athletic and academic career,” Washington posted on her Twitter account. The 6-foot-2-inch Washington is rated a four-star prospect and the No. 15 wing player in the country by HoopGurlz. She chose the Beavers over Gonzaga, South Carolina and Washington, among others. Washington was a first-team all-state selection as a junior after averaging 12.5 points, 8.8 rebounds and 2.1 assists. She is the third player from Gorman to commit to a Division I school, joining Megan Jacobs (Utah) and Raychel Stanley (Loyola Marymount).